The isolated volcanic island of Rapa Nui (better known in English as Easter Island, as it was first visited by Europeans on Easter Day 1722) is best known for its enormous statues, known as mo‘ai in the local Polynesian language. Although usually described as monolithic, they are not strictly monoliths, as they consist of separate elements: the main body, from the base of the torso to the over-sized head, is the principal part, with some topped by a red pukao (usually translated as “topknot”, although they may represent feathered headdresses) and the eye sockets filled with a composite eye consisting of white coral and red or black pupils. Some 887 such statues are known to exist, although 394 of them remain in the quarry where the tuff from which most are made was quarried. The principal “mystery” of the mo‘ai is why there are so many on so small an island. 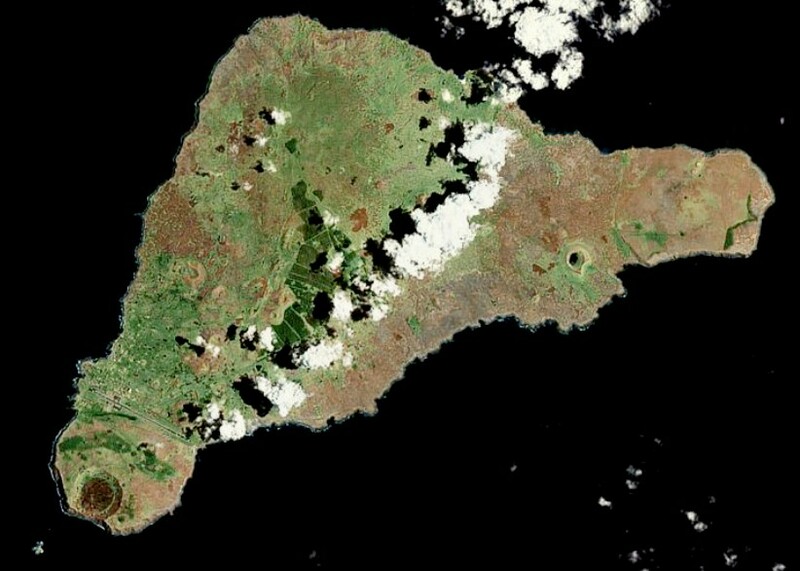 Rapa Nui, which is a Chilean territory, has an area of only 163.6 km2 (63.1 square miles) and is unlikely ever to have supported an especially large population. According to Barbara West, the early seventeenth-century population was around 15,000 people but had dropped to under 3,000 by the time of the first European contact (although this may be an under-estimate). The reasons for this catastrophic drop are not known, but suggestions include the effects of over-population, the effects of deforestation and the effects of rats. These would have caused the loss of agricultural products, the inability to build fishing vessels and a decline in the number of birds. The result was starvation, death and possibly cannibalism. It has been suggested that warfare became endemic in the century before the first European contact, but this is not supported by archaeological evidence, which suggests that after colonisation around 1200 CE, the population grew rapidly until the ecological disasters of the seventeenth century; inter-group violence seems only to have developed in the time between the visit by Jacob Roggeveen (1659-1729) in 1722 and the next European contact, on 15 November 1770, when two Spanish ships, the San Lorenzo and Santa Rosalia, stopped at the island. When Commander James Cook (1728-1779) visited the island in 1774, he reported that some of the statues were no longer upright. By then, violence had clearly begun and the last report of any remaining standing mo‘ai was made in 1838. Probably the best known “alternative” explanation for the erection of the mo’ai is that of Erich von Däniken, who devotes Chapter 8 ‘Easter Island—Land of the Bird Men’ of Chariots of the Gods? to them. It’s a thankfully short chapter of only seven pages in the paperback English translation. 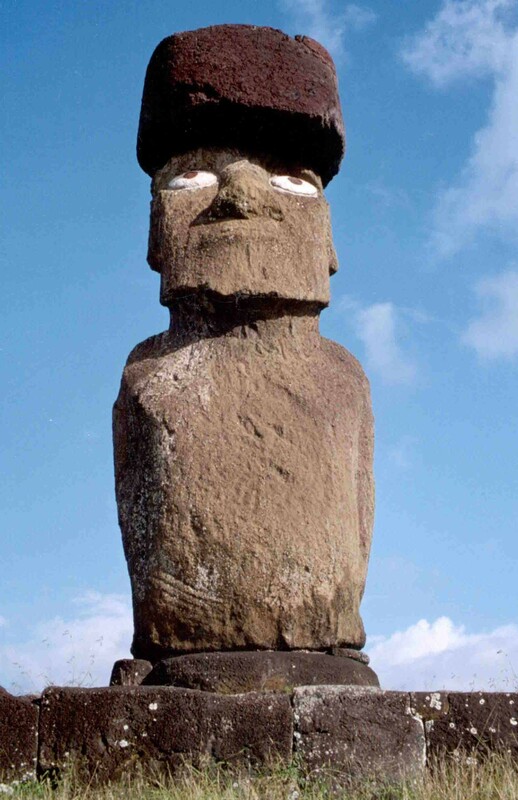 After rehearsing complaints that there were not enough people on the island to erect the statues (he claims that “the island can scarcely have provided food for more than 2,000 inhabitants”), he announces that “[c]onnexions between Easter Island and Tiahuanaco automatically force themselves upon us”, to which the only response can be “why?” The principal reason is that it gives the author the chance to pad out this short chapter with a discussion of the South American Viracocha, the Maya, Stonehenge and Sacsayhuaman that occupy considerably more space than Easter Island. 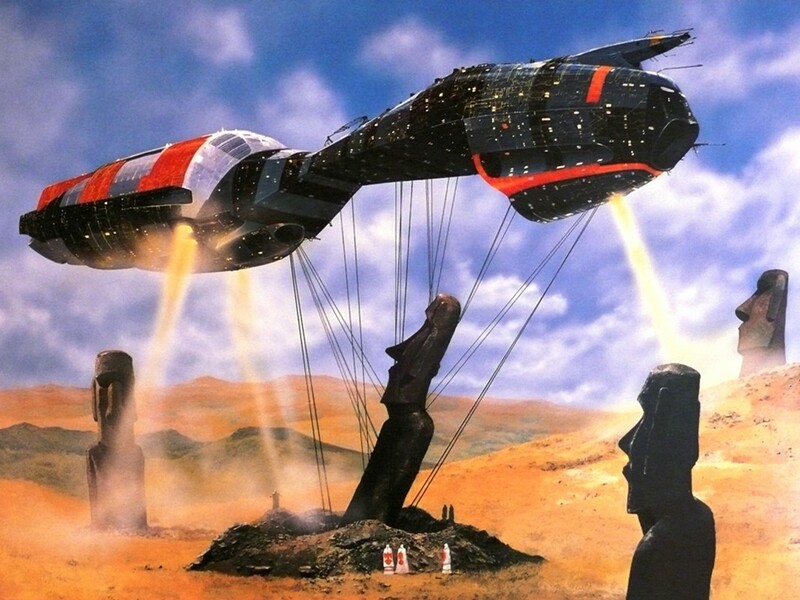 A small group of intelligent beings was stranded on Easter Island owing to a ‘techincal hitch’. The stranded group had a great store of knowledge, very advanced weapons and a method of working stone unknown to us… The strangers hoped they would be looked for, found and rescued by their own people. Yet the nearest mainland was some 2,500 miles away. Days passed in inactivity. Life on the island became boring and monotonous. The unknowns began to teach the natives the elements of speech; they told them about foreign worlds, stars and suns. Perhaps to leave the natives a lasting memory of their stay, but perhaps also as a sign to the friends who were looking for them, the strangers extracted a colossal statue from the volcanic stone. Then they made more stone giants which they set up on stone pedestals along the coast so that they were visible from afar. Until suddenly and without warning salvation was there. Then the islanders were left with a junk room of just begun and half-finished figures. They selected the ones that were nearest completion and year after year they hammered doggedly away at the unfinished models with their stone tools. So, there we have it: the mo‘ai were built by bored spacemen! Let’s not be uncharitable in pointing out the foolish idea that the islanders could not speak before the arrival of the aliens, that their fellow space travellers would be looking for them from the sea rather than space, that these technologically sophisticated strangers were without any kind of communications device and needed to erect a marker to reveal their presence… There’s really no need to point out any of this, because it is so utterly ridiculous. I almost have the impression that von Däniken had been forced to write this rubbish because critics of Chariots of the Gods? had complained that he had not come up with his promised explanation. Although some conspiracy oriented websites continue to be True Believers™ in the idea that the mo‘ai were built as a result of alien boredom, there is little mystery about how they were made and transported. Despite Erich von Däniken’s dismissal of Thor Heyerdahl’s experiment in which a mo‘ai was moved successfully using only materials available to the islanders before European contact, there is little doubt that Heyerdahl’s well publicised Kon-Tiki expedition was a major influence on the link he alleged between Easter Island and Tiwanaku (Tiahuanaco). According to Heyerdahl, similarities between the mo‘ai of Rapa Nui and pre-Columbian statuary in Perú were evidence that the island was settled by migrants from South America, not Polynesia, the mainstream view. 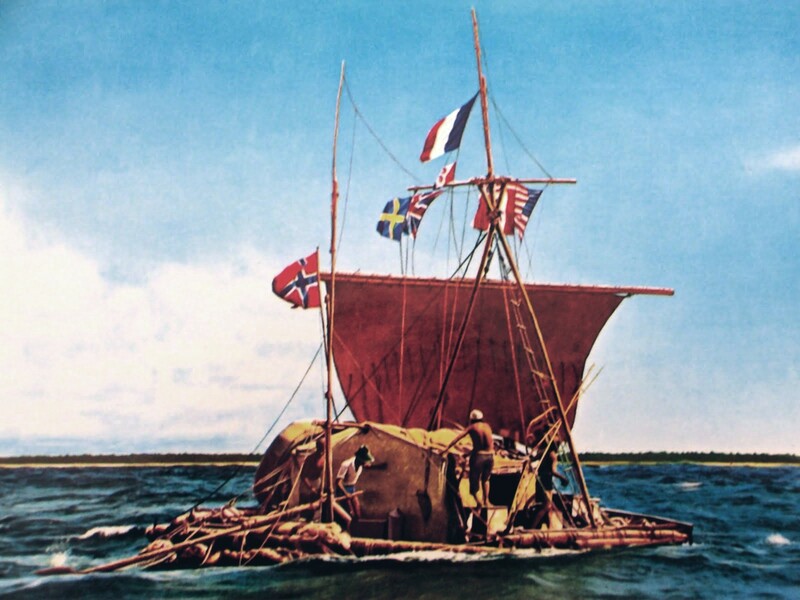 In 1947, Heyerdahl built a balsa wood raft, which he named Kon-Tiki, one of the alternative names of Viracocha (more correctly, Apu Qun Tiqsi Wiraqutra). It was based on craft in use on Lake Titicaca and it was unclear if the material or the design would be sufficiently seaworthy to undertake the voyage from the coast of South America to Rapa Nui, some 3,510 km (2,180 miles) west from the nearest part of the continent. The voyage was a success and, in that regard, demonstrated that the voyage could have been undertaken in the pre-Columbian period. What it did not do, of course, was demonstrate that such a voyage had indeed taken place. This is a methodological problem in experimental archaeology: showing that something is possible is not the same as showing that it happened. This is the problem with the so-called ‘batteries of Babylon’, where experiments have shown that they can be used (with a little modification) to produce an electric charge but we have no evidence for the use of electricity in Parthia. Indeed, in the case of the Kon-Tiki expedition, none of the other evidence supports the idea that the people of Rapa Nui came from South America. Thor Heyerdahl was an extreme diffusionist, who believed that virtually all cultural similarities had a single origin and were therefore spread by settlement. In a bizarre twist on extreme diffusion, Wayne Herschel has proposed links with Göbekli Tepe, a site in eastern Turkey dating from the tenth millennium BCE. When did a chronological gap of eleven milleninia ever matter to Bad Archaeologists? Despite his unusual ideas about the origins of Rapanui cultre, Thor Heyerdahl carried out the first systematic archaeological work on the island, demonstrating that it is indeed possible to carve the statues from the volcanic tuff using stone pounders and the transport them using locally available materials. His pioneering work has demystified the mo‘ai and enabled subsequent archaeologists to concentrate on understanding the culture of the island’s inhabitants. I wish I didn’t have to include this, but I do… The idea that there was once a continental landmass in the Pacific Ocean, called Mu, has been so thoroughly debunked that it feels like a waste of time dealing with it. Nevertheless, it has formed part of Graham Hancock’s ideas about an advanced civilisation during the latter part of the Pleistocene, that left behind all sorts of clues to its existence in later cultures. The traces of the civilisation itself are lost beneath the ocean waves as a result of rising sea level in the Holocene. Needless to say, Hancock’s ideas have not met with widespread approval from the archaeological community and he now appears to have backed down from some of his more extreme claims. Why were the mo‘ai erected? The builders placed the statues on stone platforms (ahu) close to the sea-shore, facing inland. Radiocarbon dating suggests that the earliest were put up soon after the arrival of the settlers, around the middle of the thirteenth century CE and that they continued to be made for the next two hundred and fifty years. Their style is Polynesian, but their size is unprecedented; the ahu on which they were erected are also a Polynesian type (although, strictly, Polynesian ahu are elements within a marae, the term for the platform proper). Other elements of Rapa Nui culture show links with Polynesian culture: the language belongs to the East Polynesian Group, with close similarities to Marquesan and Māori, while the traditional religion was a form of ancestor worship, that statues representing important ancestors. The indigenous inhabitants’ myth of origin traces their homeland to an unknown island called Hiva, which is thought to be the Marquesas, which is unsurprising, given the linguistic affiliation. In short, we know when, how and why the Polynesian islanders constructed the mo‘ai of Rapa Nui. We understand a great deal about the technology and materials that were available to them and why the island is now so barren and thinly populated. Jared Diamond has even suggested that the competitive spirit that led to the erection of the mo‘ai may have been an important element in the environmental catastrophe that seems to have overwhelmed Rapa Nui in the sixteenth and seventeenth centuries. These days, even advocates of ancient alien contact seem unwilling to deny the very human origins of the mo‘ai. It is interesting that an archaeologist with a team of people succeeded in walking a Moai with ropes and even they were astonished by how easy it was. Googling ‘walking Moai’ will bring up videos. This success made me smile because the locals had always claimed that the Moai walked and this was disregarded as some kind of legend. Point of correction. AFAIK, balsa rafts weren’t used on Lake Titicaca. Instead, they made reed boats. Balsa trees don’t grow that high in the Andes. The odd part was that Heyerdahl used Titicacan reed boat builders to build his RA II, which he used to attempt to show that Egyptians reached the New World. The balsa rafts were used for near-shore transportation along the Pacific coast of the tropical Andes, possibly up to Panama. Two other points. While it seems logical to assume that South Americans could have made their way into the Pacific on such rafts, they would have had to beat their way across the Humboldt Current to do so, and that’s not so easy to do on a raft. Heyerdahl, if I remember properly, was towed across the current by a motorboat, so that he could sail out from there. If South Americans were sailing their rafts into that part of the deep ocean, they would have settled the Galapagos (which are in the path of the Humboldt Current for part of the year), not Rapa Nui. The other point is that there were certainly contacts between South America and Oceania. The Polynesians picked up sweet potatoes (kumara) from the South American coast somewhere around 1000 CE (give or take), and possibly left chickens and possibly even a colony in Chile. While a balsa raft couldn’t beat across the Humboldt Current, a Polynesian double-hulled waka certainly could. Last year, a flotilla of modernized wakas sailed all over the Pacific as a demonstration of how far they could sail. I saw them in San Diego, and they are impressive ships. If you want to have fun some time, you might want to deal with current Chumash ideas that their plank-built canoes came from Polynesian canoes that turned up in California. As I understand the archeology (and I’m not sure I’ve got it right), the Chumash actually invented that canoe design about 2000 years ago, or roughly 1000 years before the Polynesians made it to Hawaii and thus came anywhere within sailing distance of California. Since Heyerdahl also claimed that the Hawaiians were actually misplaced Northwest Indians, you could have some fun with this one if you’re ever looking for a posting topic. Your use of Jared Diamond, a known cheater, tells everyone that you apply your qualified criteria hypocritically. You are as bad as those you complain about. Is this the basis for your accusation that Jared Diamond is a cheat? It’s a pretty weak accusation, besides which, it really has no bearing on the quailty of his ideas. The tagline of your blog – A site for the Glory of God – suggests to me that you work from foregone conclusions to bolster your religious beliefs. Does that mean that I can’t trust a word you say? If I apply the standards you seem to have set me about mhy sources, then, yes, it does.